﻿ Scrap Metal Shredder Factory, Company, Manufacturers - Jiangsu Huahong Technology Stock Co., Ltd.
Huahong Technology is devoted to be the world-class professional manufacturer and service-offer of the processing equipment for the recycling resources, and contribute to constructing a resource-saving and environment friendly society. It mainly manufactures kinds of Scrap Metal Baler, Shear, Scrap Metal Shredder, Waste Automobile Dismantling Equipment, Non-metal Baler, Compressor and the Comprehensive Production Line of Household Garbage. 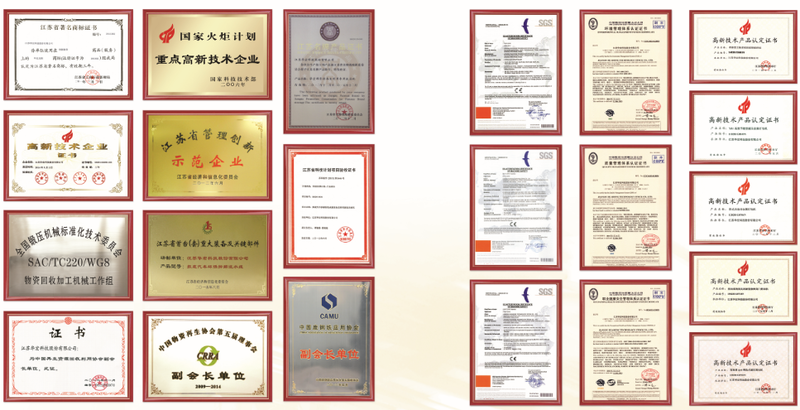 The products are applied to the National Circular Economy Park, National Urban Renewable Resource Base, Steel and Nonferrous Metal enterprise, Waste Steel Processing Center (Base) and Household Garbage Processing Center. The products have gained wide social approval and market coverage. After 20 years’ development, the company has grown to be a renowned enterprise in manufacturing complete sets of processing equipment for recycling resources. Huahong Technology pays high attention to and insists vigorously promoting technical innovation and research, standardized production and the construction and investment of the marketing system. At present, the technical system has “Three Stations, Two Centers”: National Postdoctoral Workstation, Academician Workstation, Graduate Workstation; Jiangsu Hydraulic Project Technique Research Center, Jiangsu Certified Enterprise Technology Center. The company participates in formulating and revising 5 main industry standards organized by MIIT. Up to now, it has 74 national patents. Complete set of Waste Automobile Dismantling Equipment and the Research on Its Key Technique is the scientific and technological transformation project of Jiangsu Province. 16 related patents are being declared. The production system executes complete quality control and management chain. We own kinds of more than 300 sets of large high precision NC production equipment and advanced precise quality testing equipment and method. The annual capacity is about 4 200 sets. The marketing system has covered the whole China’s market and offers high quality products and efficient service for over 60 countries. The marketing team has professional technique and rich experience, which will offer the customers both home and abroad efficient and perfect solutions for the recycling resource projects and comprehensive after service and support. Looking forward to the future with high ambition, Huahong will take the enterprise concepts of “taking technological innovation as guide, serving customers as tenet and market value as core”, and aim at winning customer’s trust and support with unremitting hard work. Huahong Technology is expecting to make greater contribution to the development of the circular economy. Continuous improvement exceeds customer expectations.